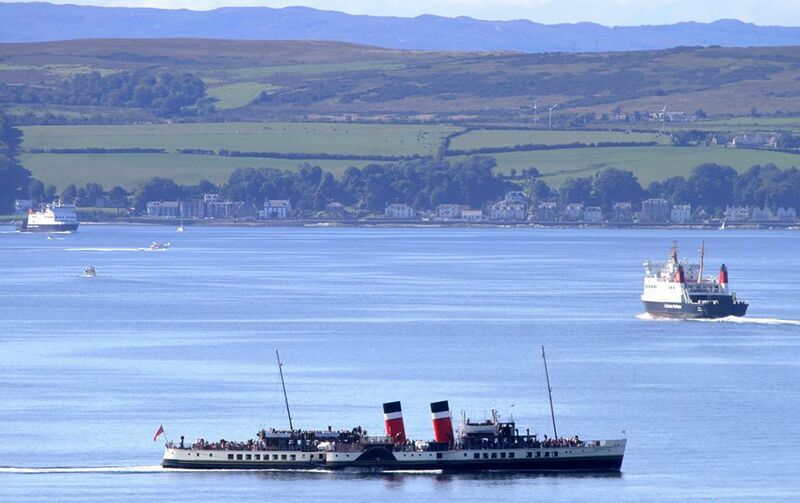 Paddle Steamers are ships which are now firmly established favourites in the tourist industry, providing excursions amongst fine scenery on lake, river and in the case of the UK's renowned Waverley, coastal cruises. Their steam engines, linked to large paddle wheels, are a unique selling point and these engines provide a quiet, smooth and virtually smell-free experience for the customer. They are, of course, survivors from bygone days when paddlers were common sights, even on the high seas. Photo Above : Paddle Steamer Schiller at Brunnen, Lake Lucerne in 2008. 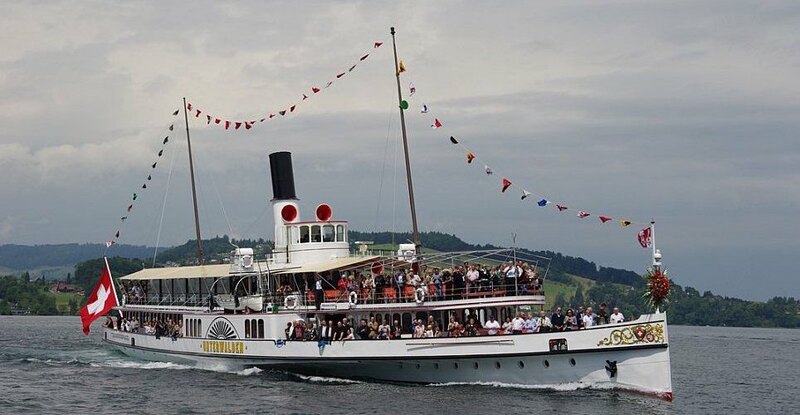 Schiller is one of five paddle steamers in the SGV fleet on this beautiful lake in Switzerland, where such ships are now seen as an indispensible tourist attraction and where they survive as part of an extensive fleet of more modern motor vessels. 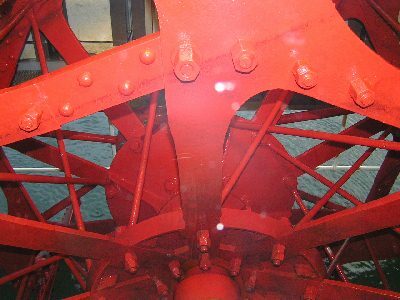 What are the distinguishing features of a paddle steamer ? The method of propulsion used by the first steamships and still ideal for calm and shallow waters. Many paddlers have viewing port-holes on the main deck so the turning wheels and splashing waters can be seen to good effect. From a distance, Paddle Steamers can often be identified by their distinctive paddle boxes, with vents of different sizes and shapes, often highly decorated. 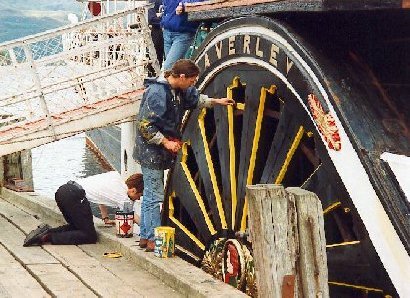 The Paddle Steamer Waverley's port side vents gets a touch-up of paint whilst she waits at Tighnabruaich. Follow the links on the blue main index (below and near foot of the page) which take you to the main sections of the database where you can research excursion and inshore-ferry paddle steamers in detail whether operational, preserved, laid-up and at risk or now consigned to the pages of history books. 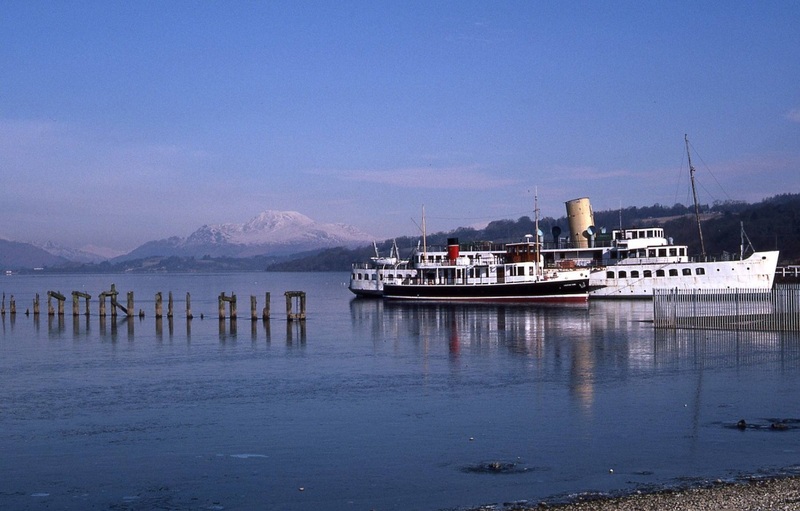 Gordon Stewart is keen to promote paddle steamers, and educate the public into their historical significance, both objects of the UK's Paddle Steamer Preservation Society of which he is a member. He has created what is probably the internet's most comprehensive reference resource for excursion paddle steamers worldwide. The historical database is limited to coastal, river and inland passenger paddle steamers . The website is illustrated by Gordon's own photography (of which there is a full archive) and images kindly supplied for publication by his worldwide correspondents. This is not a full history of paddle steamers. Readers are invited to research individual vessels or sailing areas in more detail. A limited bibliogrpaphy is provided. WHAT IS IT LIKE ABOARD A LAKE, RIVER OR COASTAL EXCURSION PADDLE STEAMER ? The first ships powered by mechanical means were Paddle Steamers. Although not the first steam-powered vessel by any means, their commercial use can be traced back to 1807 when Robert Livingston and Robert Fulton started a public service on the Hudson River between New York City and Albany with the "North River Steamboat", which much later became popularly referred to as "Clermont". A photo of a centenary replica is shown above. British commentators, at least, acknowledge the paddler "Comet" which, in 1812, introduced a service between Glasgow and Helensburgh to bring customers quickly and reliably to Henry Bell's hotel on the Clyde coast. There had been earlier reasonably successful attempts to operate steamships, notably in the USA, France and Scotland, but not in a commercial context. The idea of applying steam to drive vessels went back further still but awaited the advancement of technology to make it practicable. Mechanical propulsion meant that ships were no longer subject to the vagaries of the wind and could sail with some degree of certainty and closely to a published timetable. Paddle Steamers were soon to be found criss-crossing the oceans and penetrating major rivers deep into developing continents as boiler, engine and paddle wheel technology advanced rapidly. However, the development of the screw propellor saw them made obsolete and replaced in most marine applications, and even steam was, in time, replaced by new power sources, particularly diesel. The paddle steamer notably continued to hold its own on the short-sea passenger services between the UK and continental Europe and Ireland, but the refinement, after 1901, of the steam turbine, unsuited to paddle propulsion and finding a couple of extra knots for services where speed was of the essence, resulted in no further construction of paddlers for this business. Relegated to secondary duties, few survived long. Steam turbines also widely usurped the traditional vertical reciprocating engine in screw steamers. On lakes, rivers and coastal services where paddle steamers were most suited and survived the longest, a later challenge came from oil and diesel powered vessels, which brought a significant reduction in fuel consumption. The 1920s saw the last of the great American paddle steamers, which had evolved into an enormous size, built. So too in Europe with its much smaller-scale vessels. In the United Kingdom it would continue into the immediate post-World War II period and in the former Soviet Union, a little longer. It was not only to new forms of shipping that paddle steamers lost out. Where once ships provided a vital link with remote coastal communities and where rivers were the prime means of communication with the interior, the expansion of first railways and then roads often meant that services became increasingly redundant. In the USA in particular, operators went for increased capacity and luxury at a low price. This tempted many away from the less comfortable overland trips, but when demand fell, the consequences for the operators were serious and generally fatal. Some paddle steamers were designed specifically to carry railway carriages where expanses of water remained to be bridged, but this was only a short-term need. Very few car ferries were ever built as paddle steamers. Virtually all that remained for paddle steamers was excursion traffic and in most cases this business alone could only justify much smaller vessels. Often it could not justify any service at all. Despite the rapid rise in tourism around the world, there was only a chance of success if the ships were located in places to which the tourists actually went in large numbers and where they were likely to wish to take a boat trip. 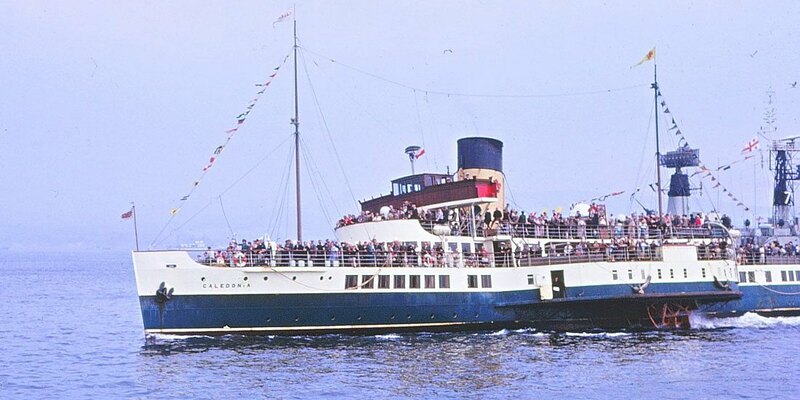 Traditional holiday destinations such as the resorts on the Clyde in the UK declined in importance and with them the requirement for passenger ferry and excursion fleets. Where demand held up it was still assumed that any remaining paddlers would eventually be replaced by motor ships. Their fortunes turned on vociferous public preservationist groups raising awareness of their demise, persuading operators to retain and renovate their paddlers and raising money to make it worth the operators' while. Such groups had their most marked success in Switzerland, beginning with the saving of Lake Lucerne's PS Unterwalden in the late 1970s. Where they were unsuccessful, some groups have had to restore and operate vessels on their own account. With heritage preservation and nostalgia now being key elements in the tourism industry, those areas still possessing paddle steamers are capitalising on their tourist potential. 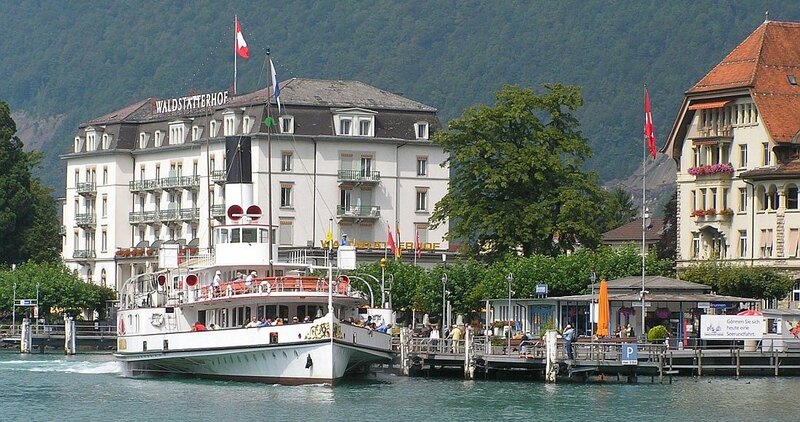 In Switzerland no paddle steamer has been withdrawn since Unterwalden's future was secured. Since then she has passed her 116th birthday, undergone two major overhauls and it is virtually inconceivable that she will not receive yet another when the due time arrives. It was a short-lived heyday. Nevertheless, paddle steamers can be credited with facilitating a rapid expansion of world trade, connecting remote communities to a modernising world and the opening up of undeveloped continental interiors to explorers, colonists and empire builders. They can now be credited as opening a window on the past yet providing a fascinating and enjoyable boat trip for the modern excursionist. Tattershall Castle and her sister Wingfield Castle (1934) were innovative paddlers, designed to carry cargoes on the relatively short crossing of the Humber Estuary between Hull and New Holland, and in the photo above dated 1971 by Jake Dale, it can be seen that the cargo space became useful for carrying cars. Nevertheless, the two only had a few more years of working life and their younger quasi-sister Lincoln Castle only until 1978, replaced by a diesel car ferry temporarily introduced in anticipation of the ferry service being replaced outright by a road suspension bridge in 1981. Paddlers ruled here because of the shifting sands in the estuary which created large areas of shallows, whose locations constantly changed. Germany's mighty River Rhine was a stronghold of paddle steamers providing connections between piers along both sides of the river - primarily for passengers, but in early years, goods as well. 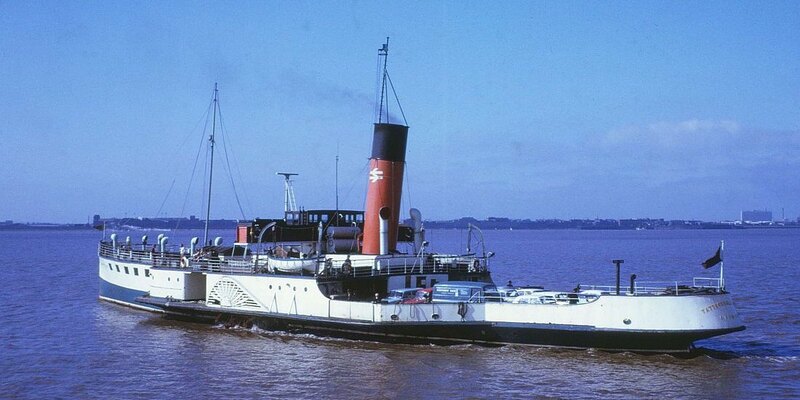 The river has always been a major bulk freight artery and paddle steamer tugs were once numerous. PS Goethe (seen on the right in the photo above taken in 2000 by Gordon Stewart) was built in 1913 as a goods and passenger ship and has been expensively rebuilt on two occasions for her now passenger-only role. The last paddler built for the German section of the Rhine appeared in 1929 and operators KD have since then specified motor ships (often propelled by Voith-Schneider units) as road, rail and bridge connections left the ships increasingly with the tourist trade only. From 1981, Goethe was the only remaining paddler and even she was withdrawn in 1989. Restored late in 1996 after a significant rebuild she was placed on the "Nostalgic Route", the highly-scenic tourist run between Koblenz and Rudesheim. Still marketed as a nostalgic paddler, she was converted to motor operation after the 2008 season, partly on technical grounds but also as a cost-limiting measure. Fuel costs were reported to have halved after the conversion and there were also savings in engine room personnel. 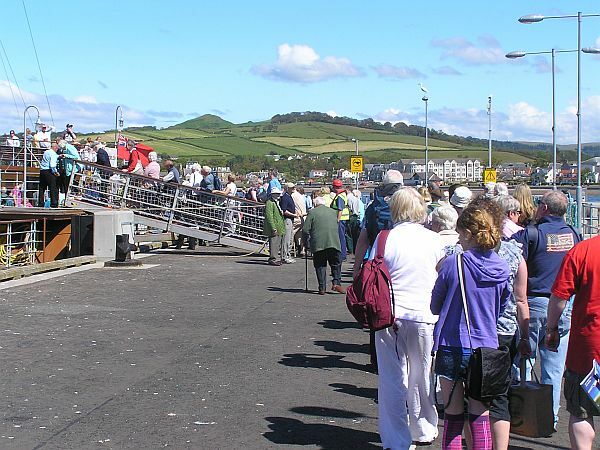 At the right place at the right time and going to the right places, paddle steamers can attract the crowds like Waverley at Largs in 2011 (above). The addition of a paddle wheel to a ship indicates that even just appearing to be a "paddle steamer" gives a ship an important selling point. Mock wheels tend to be more common on motor ships trying to imitate Mississippi-style steamers with a large wheel at the stern, but mock side-wheels are not unknown. The photo above shows the Yarmouth Belle, taken on the Upper River Thames near London in 2010 and kindly made available under Creative Commons License by owner Garry Knight. What is interesting about Yarmouth Belle, now owned by the renowned and historical Turks shipping company, is that its wheel, a very poor decorative representation, has been added only recently to what was a magnificent historical vessel dating from 1892. The operator's website rather disingenuously called her a "traditional English side wheeler"
Maid of the Loch (above) looks like she is ready to cast off from Balloch Pier on Loch Lomond. Unfortunately she has been out of service since 1981, but much work in recent years has meant she has been open to the public for static use. Hopes that a major grant from the UK's Heritage Lottery Fund would allow her to be returned to service in 2019 were dashed when it was announced that the project had failed to get the required funding at the September 2018 round of allocations. It is anticipated that a bid for the funding will be re-submitted for future assessment, but in the meantime, her enthusiast owners continue to raise funds and work on her restoration and renovation. The main sections of this database are listed on the blue main menu below. The main menu can be found on the entry pages to each section and at other points in the database. You will normally be able to get back to the entry page for each section by following the return links at the bottom of individual pages. It is an almost impossible task to cover such an enormous subject, deciding what to include and within those topics, how much detail to present. This book makes a good attempt. They key things to take away are the reasons why certain things happened causing the "rise and fall". The webmaster attempts to keep information as up-to-date as possible but does not guarantee that any information such as ship status etc is necessarily current. If you have any news updates or corrections, please advise the webmaster so these pages can be updated. Any views expressed are those of the webmaster alone unless otherwise indicated. What counts as a Paddle Steamer in this database ? All material and photographs displayed on this website are the property of Gordon Stewart or the accredited photographer where shown and not for re-use without permission of webmaster (uncredited photos are those of the webmaster) or photographer unless allowed under the appropriate Creative Commons licence (quoted alongside all photos used under this permission). All photographs displayed are with the permission of the acknowledged photographer but are not to be copied for re-use for any other website or publication without the specific authorisation of the photographer. You are welcome to use the text from this website as a research source and basis for your own work but it should not be copied and republished elsewhere verbatim or only slightly altered. The webmaster gratefully acknowledges many sources of information, including websites shown on the links page, magazines such as Paddle Wheels and Dampferzeitung and published books which he has read and absorbed information from. Many of these are listed in the Bibliography sections of the main pages to which they refer and readers of this website are referred to these books for much more detailed information about the relevant subjects. Thanks go to everyone who has submitted photos. They are acknowledged on the website alongside their photos. Particular thanks to Kenny Whyte, renowned ship photographer resident on the Clyde coast for his kindly allowing me to use numerous images from his collection. Most of the information available to me is presented in abbreviated form in this database and it is unlikely that I will be able to help with ships which are not included in this database, but please send the webmaster an e-mail and I will give as much assistance as I can. I can for example also give general guidance about paddle steamer services in Europe (e.g. Swiss lake steamers operations) and guide you to the best sources of external information. The "Paddleducks" website www.paddleducks.co.uk is the home of the world-wide modelling community where there is a lively forum for information about paddle steamers as well as modelling issues. Paddleducks members often have access to ship plans and other information of specific relevance to modellers. 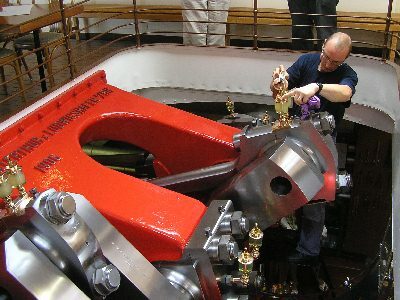 Paddle Steamer Preservation Society in the UK accepts enquiries for inspection of the material in its historical collection for research purposes. Can You Help With This database ? 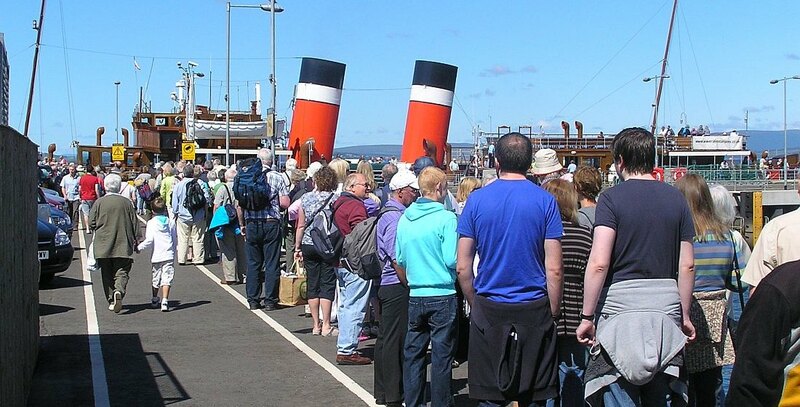 Although Clyde Steamer fleets were dominated by paddle steamers, the introduction of the turbine steamer King Edward in 1901 dramatically improved the quality of the long-distance day excursion fleet. 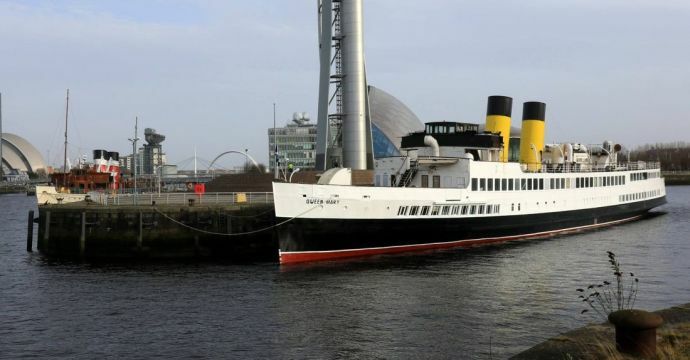 The world's first ever passenger ship powered by turbines brought a new level of speed, comfort and smoothness and in the next 35 years a number of excellent vessels joined the Clyde fleet. Gordon Stewart travels regularly throughout Europe to create what is perhaps the finest tramway photograph resource on the internet. Although trams are the focal point and common thread throughout, it is where they are running which provides the diversity and interest in his photos. As well as city centres with their grand architecture, Gordon takes you to less well-known suburbs to give a real feel for the tramway city. 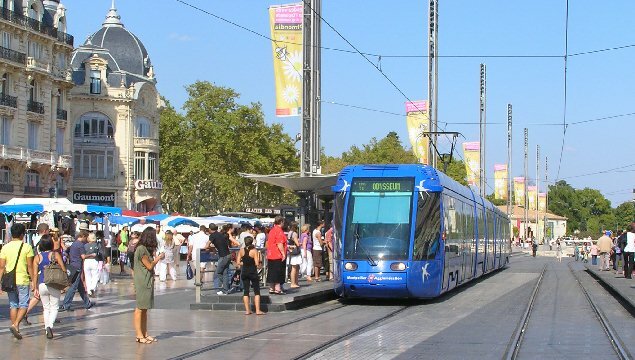 The photos are becoming an important historical record for those interested in the city itself as well as its trams and also show how trams fit into urban environments to provide an attractive and accessible transportation system.